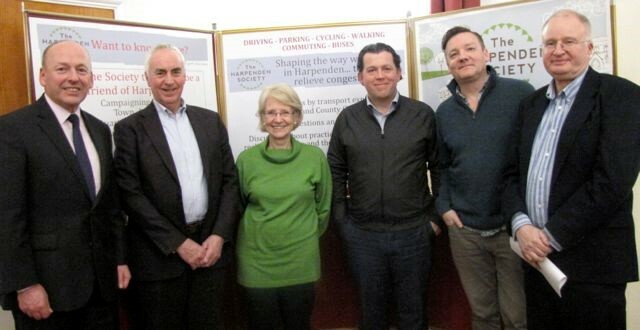 It became abundantly clear, at a packed Harpenden Society meeting in January, that transport and related issues, notably car parking, loom large in local concerns. After hearing five guest speakers give their - at times controversial - views on ‘Shaping the way we travel….to help relieve congestion’ - members of the 80-strong audience were eager to join in what proved to be a lively debate. Phil Waters, the society’s chairman designate, whose own professional experience covers several transport matters, including the founding of the Hatfield-based UNO local bus service, set the scene for a fruitful exchange of opinions. He said Harpenden’s attractions as a town were apparent to everyone. But they had to be set against its many transport-related challenges, many of which arose from above-average car ownership…and usage. In consequence, cross-county bus services serving Harpenden were not well used, parking problems were getting worse, and air quality measurements showed high levels of pollution, notably in the High Street, Station Road and Southdown Road. Surveys conducted for the county’s Hertfordshire Transport Vision 2050 report had shown, surprisingly, that only 49% of journeys in Harpenden were made by car. Nevertheless, road capacity was ‘at its limits’, while traffic forecasts indicated a further 15% surge in the number of road trips by 2031. That would bring worsening congestion which, said Mr Waters, was predicted to result in a 25% increase in journey times. He added that thanks to current constraints on the public purse there was no funding available today for new roads. Hertfordshire County Council’s budget for roads had in fact been cut by 14% over the last six years. It had to be faced, he said, that the average age of Harpenden’s population was getting older, which meant a rising need for public transport, though most existing bus services ran through the town, typically between St Albans and Luton. They were therefore of limited benefit to those living away from the main bus routes. Mr Waters pointed out that in any case the reliability of bus service timings was often disrupted nowadays by intense volumes of traffic. He described congestion as a ‘cancer’ plaguing many bus services in towns. But he foresaw ways that congestion could be eased, especially if car drivers had a convenient option of bus travel. Parents should accordingly be deterred wherever possible from ‘school run’ car use; and cycling should be made safer and more attractive for children getting to and from school. He welcomed the new Harpenden Hopper community bus initiative, expressing the hope that the service would thrive and possibly be expanded to include services linking Redbourn and Wheathampstead to Harpenden. Proof of the need for ‘Hopper style’ services was clear from findings that 63% of car journeys were under 5 miles, and many of them under one mile. Andy Buchanan, the driving force behind the Hopper bus venture, then spoke of the many administrative and technical challenges involved in planning the service, which was scheduled to begin operations on February 15. He said the potential for such a service became apparent to him and his partner in the venture Simon George, in conversations they had had with local churches and the Harpenden Trust, which had shown the isolation of many elderly and disabled members of the community living on the outskirts of the town. A questionnaire circulated to 13,000 Harpenden households brought almost 300 positive responses, showing there was a definite need for a local public transport service. Many people who responded, said Mr Buchanan, were car owners. But they recognised that, as they got older, they would have to give up driving and a convenient bus service would make that decision easier. Beginning as a three-days-a-week operation the 15-seat Hopper minibus service would initially run from Kinsbourne Green car park to Church Green, following the route detailed on page 12 of our Winter newsletter. It would run from 9.30am to 4.30pm. There would be specific pick-up points, but the bus could be hailed anywhere along the route. In the interests of environmental friendliness, it was hoped that in the future, if the service proved as popular as everyone hoped, quiet and pollution-free electric buses could be acquired. In the meantime, said Mr Buchanan, he was continuing to appeal for more volunteer drivers. The next speaker was Brian Deegan, a traffic engineer specialising in road layout and design, who spoke of the challenges he faced when working for Transport for London (TfL), and their relevance in tackling many of the issues now arising in the Harpenden area. Bureaucratic inertia dogged too many initiatives in tackling transport problems, he said. But health and safety were issues which nowadays often forced local authorities into action. Everyone agreed with the basic tenet that cycling should be encouraged. It provided healthy exercise and was pollution free, though there was admittedly a safety issue where bikes had to share road space with cars, lorries and buses. But Mr Deegan contended that, despite media publicity drawn by accidents to cyclists, TfL statistics showed that, even in London, the risks were infinitesimal. Cycling and walking were, in many cases, viable alternatives to driving, in and around a town the size of Harpenden. In Mr Deegan’s judgment, a reasonably fit person could walk from one side of the town to the other in 20 minutes or, in the same length of time, they could cycle from Wheathampstead to Redbourn. What makes a street healthy and welcoming, was a rhetorical question Mr Deegan endeavoured to answer. It should be easy to cross, have seats where pedestrians can relax and feel safe, with clean air and a low noise level allowing people to talk without shouting. He criticised many of the footways (pavements) in Harpenden’s busy minor roads, such as Roundwood Lane and Carlton Road, for being too narrow for safety; a width of 4ft 7in (1.4m) should be the minimum. Also on safety grounds, pedestrianisation of some or all of Lower High Street - previously proposed and rejected - should perhaps be considered again. John Talbot, from the town’s car park study group set up in 2014, representing residents’ and business interests in the town, said it was vital for the parking issue to be an integral element of the forthcoming Neighbourhood Plan. The problems needed to be better understood, leading to a ‘joined up’ plan rather than a piecemeal approach - exemplified by proposals a year or so ago for kerbside restrictions in the Avenues area. A full survey was needed, said Mr Talbot, to establish a percentage breakdown of where Harpenden’s all-day kerbside parkers came from. It was recognised that a substantial number were London commuters who drove in each weekday morning from Wheathampstead, Redbourn or the smaller outlying villages. There was also anecdotal evidence that people from distant parts of the country, flying off on holiday from Luton Airport, parked their cars in Harpenden streets for weeks at a time, incurring only the cost of taxi rides to and from the airport. There were, he added, inevitable obstacles, principally one of cost, to be addressed in any proposals to ease Harpenden’s parking problems. Underground car parks were perhaps the most visually attractive solution, though recent estimates pointed to a cost of around £30,000 per car space. That prompted county councillor Teresa Heritage to emphasise the present constraints on the public purse in attempts to ease Harpenden’s acute transport and parking issues. From the floor of the meeting, resident Rob Pearman made a plea, on the grounds of pedestrian and child safety, for lower speed limits to be imposed on more streets in Harpenden, particularly where parked cars on both sides make them effectively single-lane thoroughfares. He cited Tennyson Road as an example, on the grounds of pedestrian and child safety, where a 20mph speed restriction was needed. But county councillor David Williams pointed out that the police were not empowered to enforce lower local speed limits. However, there was general agreement from those attending the meeting that the alternative of adding more ‘speed humps’ in residential roads should be resisted. Meanwhile a number of those in the audience called for local campaigns aimed at encouraging people to walk or cycle, in the interests of health and fitness, while combatting Harpenden’s seemingly ingrained ‘car culture’. Joanne Wicks said youngsters should be encouraged to take up cycling as a sport and that designated cycle routes were needed ‘where people want and need to go’. A more specific suggestion from the floor was that a truly safe ‘off road’ cycle lane between Harpenden and Southdown could be provided along the edge of the common, parallel with Southdown Road. What about a London-style ‘congestion charge’ to be imposed on drivers wanting to come into the town centre, asked Ron Taylor. It would encourage informal car sharing or the formation of more formal ‘car user clubs’, possibly linked to community groups. Cllr David Williams said the proposal could, perhaps in 10 or 15 years time, when the technology had been refined, be integrated into a road charging scheme.